BENGHAZI-GATE: Barack Obama lied, imagine that … What did he know and when did he know it? How About from the earliest Moments!!! From James Rosen of Fox News, ‘The Benghazi Transcripts: Top Defense officials briefed Obama on ‘attack,’ not video or protest’. On September 11, 2012 the United States Consulate in Benghazi, Libya was attacked and four Americans were killed, including Ambassador Stevens. Barack Obama and his minions blamed the attack on a video tape, but as it turns out Obama knew from the outset that it was a terror attack. This information blows a hole wide open in Obama, Hillary’s and the rest of the Democrat puppets talking points. No wonder Obama targeted James Rosen, eh? Minutes after the American consulate in Benghazi came under assault on Sept. 11, 2012, the nation’s top civilian and uniformed defense officials – headed for a previously scheduled Oval Office session with President Obama — were informed that the event was a “terrorist attack,” declassified documents show. The new evidence raises the question of why the top military men, one of whom was a member of the president’s Cabinet, allowed him and other senior Obama administration officials to press a false narrative of the Benghazi attacks for two weeks afterward. Gen. Carter Ham, who at the time was head of AFRICOM, the Defense Department combatant command with jurisdiction over Libya, told the House in classified testimony last year that it was him who broke the news about the unfolding situation in Benghazi to then-Defense Secretary Leon Panetta and Gen. Martin Dempsey, the chairman of the Joint Chiefs of Staff. The tense briefing — in which it was already known that U.S. Ambassador to Libya Christopher Stevens had been targeted and had gone missing — occurred just before the two senior officials departed the Pentagon for their session with the commander in chief. According to declassified testimony obtained by Fox News, Ham — who was working out of his Pentagon office on the afternoon of Sept. 11 — said he learned about the assault on the consulate compound within 15 minutes of its commencement, at 9:42 p.m. Libya time, through a call he received from the AFRICOM Command Center. “In your discussions with General Dempsey and Secretary Panetta,” McKeon asked, “was there any mention of a demonstration or was all discussion about an attack?” Ham initially testified that there was some “peripheral” discussion of this subject, but added “at that initial meeting, we knew that a U.S. facility had been attacked and was under attack, and we knew at that point that we had two individuals, Ambassador Stevens and Mr. [Sean] Smith, unaccounted for. What say you New York Times? 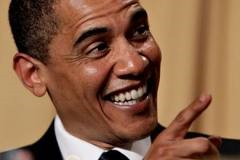 Gallup Poll: Barack Obama’s Greatest Failure … OBAMACARE, His Greatest Achievement … NOTHING!!! President Barack Obama’s presidency in a nutshell … his greatest failure is his signature piece of legislation, Obamacare. According to a recent Gallup poll, Barack Obama greatest failure of his presidency to date by an overwhelming number of 36% has been Obamacare, followed by not getting along with Congress and working with Republicans (9%), lack of communication (5%), lack of leadership (4%) and so on. When it comes to Obama’s failures, there is so many to chose from. 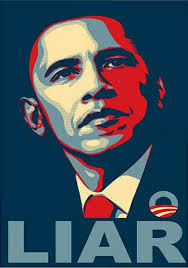 You could have answered the questions of Obama’s failures, the jobless job recovery, the economy, real unemployment, record number of Americans on food stamps, record $17 trillion debt, wasteful spending, investments in green energy, the scandals (IRS-gate, Fast & Furious, Benghazi-gate, AP-gate, Fox/Rosen-gate, NSA spy-gate), Middle East Arab Spring, Libya, Egypt, etc. On the other hand, Republicans (50%) and Democrats (25%) alike are most likely to mention Obamacare as the president’s biggest failure, although Republicans are twice as likely to do so. This suggests that even Democrats recognize the negative issues associated with the new healthcare law and its implementation. Republicans also cite Obama’s lack of communication and lack of leadership as a failure, while Democrats mention his inability to get along with Congress and Republicans, his lack of communication, lack of immigration reform, lack of leadership, and his inability to bring all troops home. Hey America, did I tell you that you can keep your healthcare if you like it? I am not quite sure what some of these media outlets like CNN and … are reporting that Obamacare in Barack Obama’s greatest achievement and failure. Take a look at the poll below, “Nothing/None” at 23% is #1 as Obama’s greatest achievement to date, the ACA/Obamacare is second. Honestly, one would have to be hard pressed to name anything that this president has accomplished that would be considered an achievement and benfit for the United States of America. 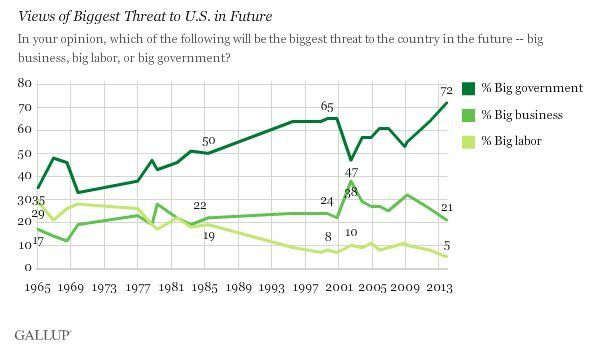 According to the latest Gallup poll, an astonishing 72% of Americans now say that “BIG” government is the greatest threat to America as compared with big business and big labor. WOW!!! The PJ Tatler makes an astute observation that has a lot of merit, see the chart below and notice when the noticeable upward trend began in 2009. Hmm, what happened then? Of course this boost in Americans fear of big government has everything to do with the so-called “Hope & Change” that they voted for in electing Barack Obama. It would appear that the folks at Hot Air noticed the remarkable trajectory as well. He promised transparency and delivered something quite different. What’s the matter America, you have a problem with the IRS enforcing Obamacare? Personally, I think they need to start including the MSM in these polls as well. America, wake the hell up and make a stand against “BIG GOVERNMENT” liberalism or it will be here to stay. Elections matter, get out and vote against it if you feel strongly against it!!! Seventy-two percent of Americans say big government is a greater threat to the U.S. in the future than is big business or big labor, a record high in the nearly 50-year history of this question. The prior high for big government was 65% in 1999 and 2000. Big government has always topped big business and big labor, including in the initial asking in 1965, but just 35% named it at that time. The latest update comes from a Dec. 5-8 poll. Gallup has documented a steady increase in concern about big government since 2009, rising from 55% in March 2009 to 64% in November 2011 and 72% today. This suggests that government policies specific to the period, such as the Affordable Care Act — perhaps coupled with recent revelations of government spying tactics by former NSA contractor Edward Snowden — may be factors. I would also add this upswing has in part to do with a bunch of gutless, establishment RINO’s who think that it is more important to sell ouch their Republican principles and protecting “We the People” as opposed to retain their power. Last night on the Kelly File’s, Megyn Kelly discussed with Obama sycophant and National Press Secretary for Obama’s 2012 campaign Ben Labolt about Sen. Cornyn’s comment that, “I think the current administration has taken lying to a new level.” In typical Obama/Saul Alinsky fashion, Labolt attacked Republicans for the failures of Obamacare. Pathetic. Then he went on to lie and say that Obama apologized for lying to Americans, that they could keep their healthcare plan if they liked it, Period! Of course Kelly was quick to correct the Obama mouth peice to say that what the president said was that he was sorry that people found themselves in the situation they are in because of something he said. And of course there was the typical “blame Bush” attack. What a pathetic bunch of people who just are incapable of telling the truth and owning up to it when they are caught red handed. Come on America, I think it was pretty obvious that Barack Obama, Democrats and their minions mislead and lied to the American people. Sen. John Cornyn says the White House has been lying about the attack on the U.S. diplomatic mission in Benghazi, Libya, and accused them of a cover-up. “I think the current administration has taken lying to a new level,” Cornyn said during a Google hangout on Monday in response to a question about Benghazi.